Lido Consulting, Inc. hired The Illusion Factory to design and produce their website. Lido Consulting, Inc. was formed in 1995 to serve the Family Office Industry and high net-worth individuals. 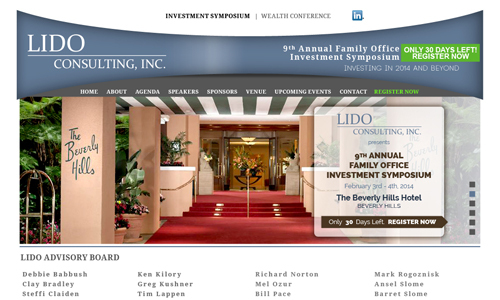 Lido Consulting is well known for organizing the Southern California Family Office Directors Association and its exclusive Family Office Conference held each fall. Lido Consulting, Inc. provides consulting services for families with substantial wealth and resources to those responsible for the management of wealth. They are dedicated to offering customized assistance tailored to fit the specialized needs of prominent families. Lido Consulting formed the Southern California Family Office Directors Association to facilitate the sharing of management and investment ideas among Family Offices.